Cockatiels need lots of attention and time away from their cages to be happy. A cockatiel's favorite perch is generally its owner's shoulder. Cockatiel owners love spending time with their birds. What they don't love is what the birds leave on their clothing and furniture. Most people don't realize it, but birds can actually be potty trained. If you take the time to potty train your cockatiel, you will be able to enjoy having it out of the cage without having to clean up afterward. Observe your bird's behavior for a few days. Try to determine when it poops, how often it poops and any special behaviors it exhibits before it poops. For example, many birds take two steps back and lift their tails before making a deposit. Others become hyper and dance around. If you can tell when it is about to poop, training it will be much easier. Determine where you want the bird to poop when it's outside the cage. For example, you may want it to return to its cage, or you may want to set up a special perch it can use. Other good options are over the sink or over a trash can. Praise the bird lavishly when you see it potty in its cage. Give it treats and affection, and repeat a short key phrase such as "Go potty." The bird will come to associate the act of defecation with this key phrase. It might also learn to speak the phrase after hearing it so much. Choose your key phrases wisely. Observe your bird when you have it out of the cage for signs that it is about to eliminate. Then, take it to the designated bathroom spot. If your bird doesn't have any specific behavioral cues, just take it there every 15 minutes or so. Repeat the key phrase while you hold the bird over the place where you'd like it to learn to potty. If the bird makes a deposit, praise it and give it treats. Repeat this procedure until your bird is reliably eliminating in the desired location. Your bird may learn to go to the appropriate place to relieve itself on its own, or, it may learn to tell you when it needs to go potty so you can take it to the right spot. However, each cockatiel is an individual. Instead of asking to go or going on its own, some birds may require you to periodically carry them to the potty and give them the command. Do not punish your cockatiel for going in the wrong place. 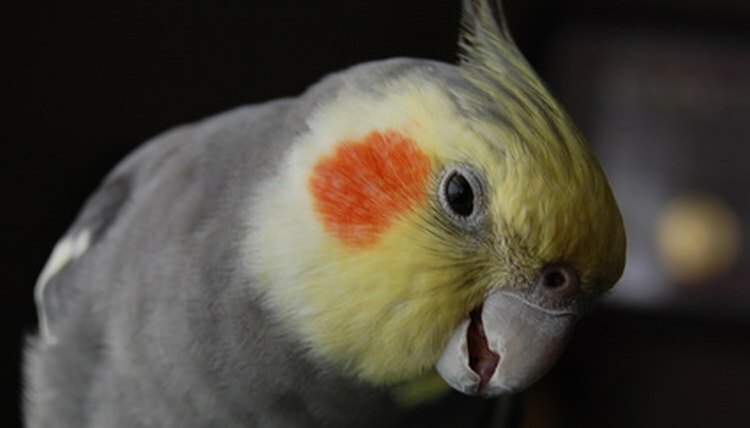 Cockatiels respond to positive reinforcement, not negative reinforcement. You can train your bird to poop on specific materials, like newspaper or paper towels. However, your cockatiel will then believe that it's OK to poop on anything that looks like the designated material.